The procedure will take place at a luxury private hospitals. You may go home the same day or stay overnight depending on the complexity of your case and time of surgery. The procedure is performed under general anaesthetic. In general, a breast implant replacement is normally a simpler procedure than the original augmentation as the pocket for the implant has already been created. The surgeon will normally make the incision along the scar line from your original surgery; thereby minimizing any further scarring. The old implants will be removed and the new ones will be implanted. The skin will then be secured using dissolvable sutures. At the Nu Cosmetic Clinic, the surgeons we refer you to aim to return you safely to your own home the same day or the morning after your surgery. You will feel some pain and have bruising and swelling after the surgery. We recommend sleeping on your back and wearing a support bra for couple of weeks. We’ll remove any stitches within 10-14 days, with faint scars likely to remain, as with any operation. You can return to work within a week, and you can start exercising normally within 4-6 weeks. At Nu Cosmetic Clinic, we ensure that you will receive free aftercare for a lifetime from the team of experts we refer you to. Click here to know more about our aftercare policy. As with any surgery, there is the small risk of complications with breast implant replacement surgery. At the time of your consultation, the expert we refer you to will take you through the risks in detail so that you can take an informed decision. They will not push you for surgery. They will give you all the time and guidance you need to take a decision. They will give you a comprehensive Breast Implant Replacement Patient Guide to take home with you. This will answer most of your queries and concerns. If you have any further questions, you can give them a call and they will provide their expert advice. You will love them for their honesty, integrity and professionalism. Yes, as with your original procedure, the results are permanent. If you loose/ gain a substantial amount of weight, or you have a baby, your breasts may change shape. 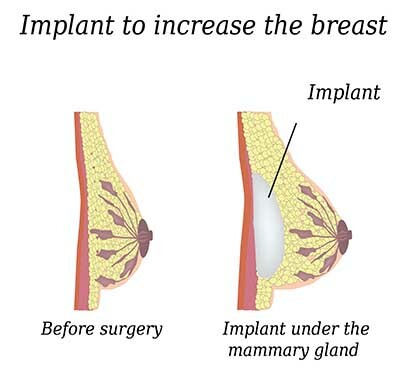 No, the only way to change your implants, increase the size, or change the shape of your breasts is by surgery. Can I opt for a different type of implant than I originally had ? Yes, many people with older implants are now choosing newer, safer implants that are available. Can I have a bigger/ smaller size than my original implants ? Yes, it is normally quite simple to go a little larger than your original implants. Smaller implants are possible, however you may need some degree of uplift to counteract any excess skin. This can be fully discussed at your free consultation. Can I have my implants removed and not replaced ? Yes, a number of women choose to have their implants removed and not replaced. However, you should be aware that as part of the original breast implant procedure, some of your natural breast tissue may have been removed, so your breasts may be smaller than previously. Your skin will also have stretched around your implants, so you may need some form of skin removal or tightening to have a pleasing aesthetic result. When should I have my implants replaced ? This is very much dependent on your original implants. If your implants are ruptured it is essential that you consider having them replaced. Some older implants are more prone to rupture and contracture (hardening) after ten years. You can discuss this fully at your free consultation. Will my scarring be worse after a second breast procedure ? Your surgeon will try their best to make incisions at the same site as the original scar. However, sometimes cutting into this area again can make the scar more prominent, this will fade over time. There are no patient stories for Breast Implant Replacement Surgery. Any form of cosmetic enhancement is very personal, so prices are bespoke dependent on your individual needs. As a rough guide, you can expect to pay £3900 – £5500.